Even after seven years of YouTube’s existence, brands still aren’t making much of a dent in the ‘YouTube 5,000’, an elite group of channels with at least 43m views each. Theoretically brands have a much greater advantage than your average YouTuber as they have more money to produce content, however according to Touchstorm’s latest study, The Touchstorm Video Index, only 74 of the YouTube 5,000 channels are from brands. In November 2013 I took a look at YouTube strategy for brands. I revealed some surprises from the research, and recommended some guidance on how brands can improve their YouTube reach. Yesterday I talked to the SVP of marketing and production at Touchstorm, Sean Womack, about the topic, and he offered the following advice for brands. Although you revealed the 74 top brands in the YouTube 5,000, can you reveal how high the top brand, Google, charted in the overall 5,000? Google came in at number one unsurprisingly, but it’s also managing its channel very well. Google is high above the industry average in views and subscribers, which is of course the popular goal, but when we dig into its success with individual videos, we see that Google’s top three videos represent 9.8% of all views. This is an important number we call ‘view concentration’. This number is important because it gives us a picture of whether or not a brand is publishing popular content regularly and maintaining that popularity and interest with its fans. Rather than a breakout video driving views, Google seems to be providing a steady path of appealing content for its audience. Some brands have one or two videos driving 80-90% of its overall views. Additionally Google has 2,868 subscribers per million views, which is above the industry average (2,276). This shows Google is consistently converting views to subscribers and building an audience ripe for its content, which is critical. The goal for a brand is to have an audience of its own, and right now YouTube is the best place online to do this. Are there any lessons that brands can learn from the top non-brand videos? The index is all about lessons for brands. Brands get to see who their real competitors are and who’s owning a share of voice in the category conversation. It’s time for brands to realise that other brands aren’t the only competitors out there. There are hundreds of thousands of YouTubers who are also making videos and building audiences in your own brand’s category. The problem is that, up until now, brands have not had any way to see or understand who these competitors are. In a category like ‘beauty’, brands have become keenly aware that YouTube gurus like Michelle Phan rule the day. We hope that the retail brands are paying attention to the ‘haul videos’ from the Bethany Motas of the world. Her three day old Black Friday haul video has 1.2m views and counting. What are these YouTuber’s doing that Brands are not? Building an audience by making content on a regular basis. Engaging with their fans in a genuine way, and they don’t stop doing it. Big budgets can rent an audience, but it takes a big commitment to build one. Which do you think is more useful to a brand: the regular uploading of modestly performing videos, or seeking that one viral smash with a single imaginative idea? The viral smash isn’t strategic and it usually isn’t viral. It is usually the result of money spent on ‘promoted video’. Now that YouTube doesn’t distinguish between paid and organic views on your view counter, no one can tell that your ‘viral video’ was just a $500,000 ad buy. We can look at a brand’s views-to-subscriber ratio. If it’s not at 3000:1 (views:subs) or less, then it’s probably on a promoted video program. Promoted video will get you views, but it doesn’t help the brand to build long-term audiences and loyal fans, and that’s the goal. Or it should be. There’s a significant difference between buying millions of views on YouTube and building a subscriber base that has told you it wants your content. Brands can develop a large owned media audience on YouTube if they develop their subscriber base and increase their views-to-subscriber ratio. Is there a social platform that YouTube embeds work better within than others? Most YouTube views do not happen on the channel page, they happen elsewhere, and it really depends on the distribution strategy of the particular YouTuber. We’ve seen syndication programs generate millions of views and just keep on growing. We think that YouTube is the most underrated, under-appreciated social media channel on the worldwide web. It’s the number two search engine behind Google. It holds content, allows for subscribers, allows for comments and audience engagement, and it also uses the most engaging and persuasive medium known to man: video. Facebook and Twitter cannot begin to compare. We think more brands need to shift their social spend significantly from Facebook and Twitter over to YouTube. You can and should be growing your YouTube Channel, even if you have limited resources and need to take dollars from other social channels. If you have the budget, should you promote your YouTube videos in other social channels? Absolutely. Which social platform works better for promotion? That all depends on what kind of video you have. But the challenge with relying on those channels for distribution is that you have to be intentional about driving people back to your YouTube channel so they can subscribe (or like and comment, but it’s subscriptions that are gold). The marketing objective is audience building, not just views. You can buy views. You earn subscribers. Is there a particular strategy, or even just tone of voice that brands should employ when engaging with commenters? Nothing will kill an audience faster than someone coming in just to talk trash or drag a conversation into the gutter. We monitor, filter, delete and block users who do this, and we do it without apology. Any conversation you would not allow at a party you are throwing, you should not allow in your comments. That’s first and foremost, for the sake of your audience. Second, the tone of voice should be authentic to the brand. If you are the kind to engage with people naturally, then pick comments to respond to or engage with. If you are uber-cool, then that should be your tone. The tone should reflect the brand and should have the same voice, and voices, that are in your videos. As much as you can, the people who star in your videos should engage with the audience. Do you think brands should engage with the more ritual abuse that every channel big or small seems to experience? You should have a thick skin and be ready for your brand to be criticised. If someone has a legit complaint or critique of your brand, this is a great place for you to engage. But it will take a special kind of brand, and based on how many gaffes we see (the #askJPM debacle springs to mind) it doesn’t seem like brands have fully figured out how to be ‘among their peeps’ without being awkward or worse. Ritual abuse: delete it and block those users. Tough critique: take a deep breath and engage. What do you think of the recent YouTube comments update? It’s clear that this rollout is another piece of the ‘author rank’ strategy that Google is implementing, and it makes it all the more important for YouTubers to ensure that they are doing everything they can to claim the authorship of all of there content, regardless of where it plays. The good thing about comments linking back to your Google+ profile is that now comments seem to matter more than ever, and we think that it should, in theory, cut down on some of the more outrageous and inane threads that many seem to devolve into. The web is trying to become a less anonymous place. We think this trend will continue and the debate about transparency and privacy is not going away and not going to slow down. But in the instance of comments on YouTube, we think that it’s actually helpful to force people to own their comments. For more guidance on YouTube strategy read our guide to why YouTube advertising is worth another look and download our Online Video Best Practice Guide. In the late 1990s the Philadelphia Inquirer published a series on “the dramatic raid of Mogadishu”. 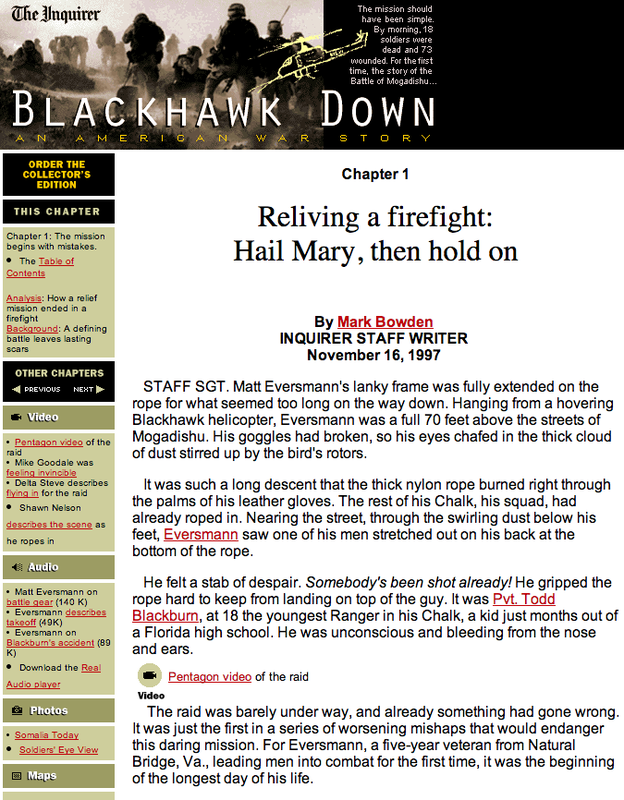 It evolved into a book and a movie called, as you may have already guessed, ‘Black Hawk Down’. This was one of the first mainstream media attempts to use the web to enhance long form content, and while the page might not look terribly pretty, all of the right kind of functionality is there. I have to credit the above statement to Will Critchlow, it condenses what I’m about to discuss in a simplified way. Essentially social media costs nothing but can be a fairly time consuming practice depending on how many platforms you choose to use. Social media is also the key way for a small business to develop awareness, raise its profile, gauge its market and interact with existing and future customers. As a small business you’re in a great position to start exploiting social media for all its worth. As the UK is celebrating its first Small Business Saturday on 7th December 2013, here I present the first in a series of posts that will take a look at each individual social media platform, and highlight how your small business can wring the best out of each one.